The Catskills community is cordially invited to a “Yuletide Festive Evening” scheduled for Friday, December 9 at 6 p.m. 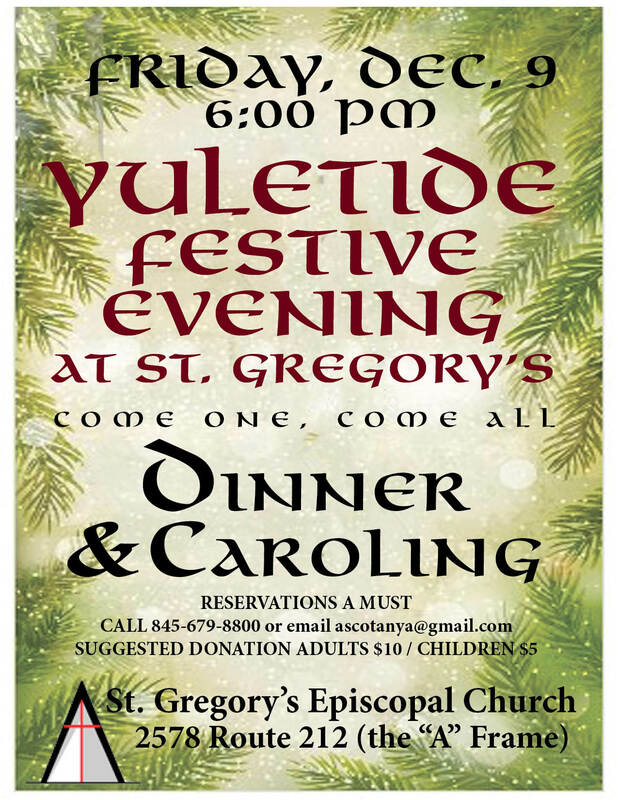 The event, to be held, at St. Gregory’s Episcopal Church in Woodstock, will feature a scrumptious dinner of chicken tetrazzini, salad, dessert and beverage (suggested $10 for adults and $5 for children). “Our intent is to make this an evening to celebrate the Yuletide season and to unite our community through food, music and the decorative styles of the holiday season,” said Ann Jung, event coordinator. According to Jung, many will recall the fall story by the New York Times magazine that highlighted the resurgence of the tetrazzini dish which dates back to the early 20th century and was named after Italian opera star, Luisa Tetrazzini. In addition to the great food, the event will feature Christmas caroling, handmade wreaths and table decorations for sale. Reservations are encouraged by emailing [email protected] or calling 845-679-8800 and leaving your reservation information. St. Gregory’s is located at 2578 Route 212 just east of the village of Woodstock.